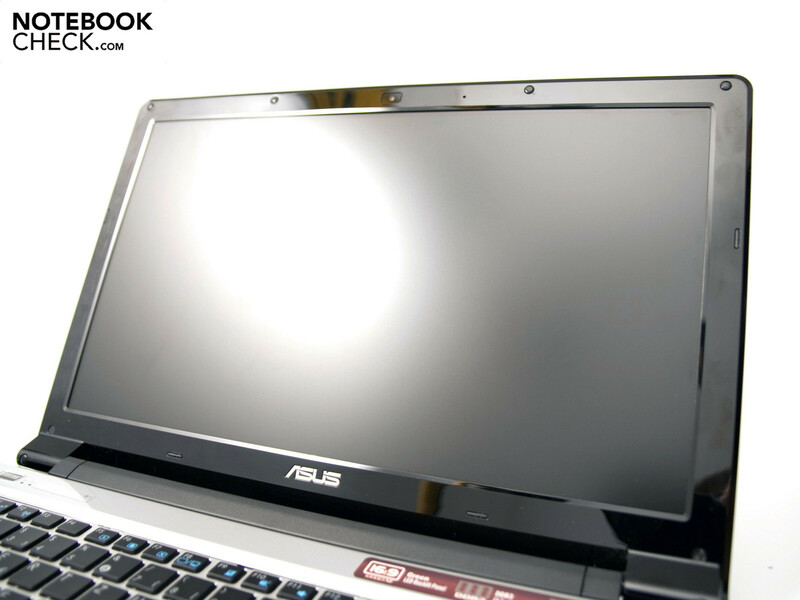 With the UL range, Asus presents new notebooks with an especially slim and elegant design. The new range is divided into three display sizes. The UL30 models are equipped with a 13.3 inch screen and integrated Intel graphic chip set. The next UL80 model size works with a dedicated Nvidia GeForce G 210M graphic and a 14.0 inch display. 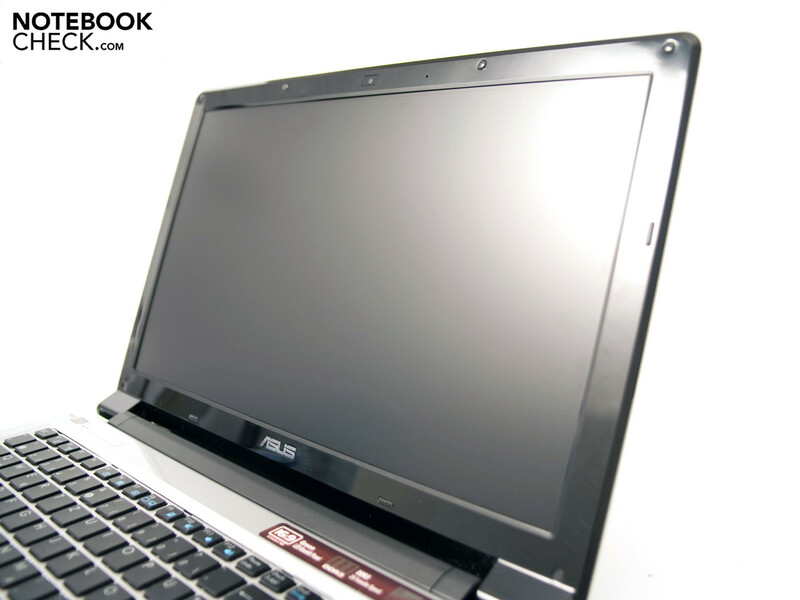 The UL50 models are also based on the dedicated Nvidia G 210M graphic, but have a 15.6 inch display. The price range of the UL series is between 649 and 899 euro (RRP). 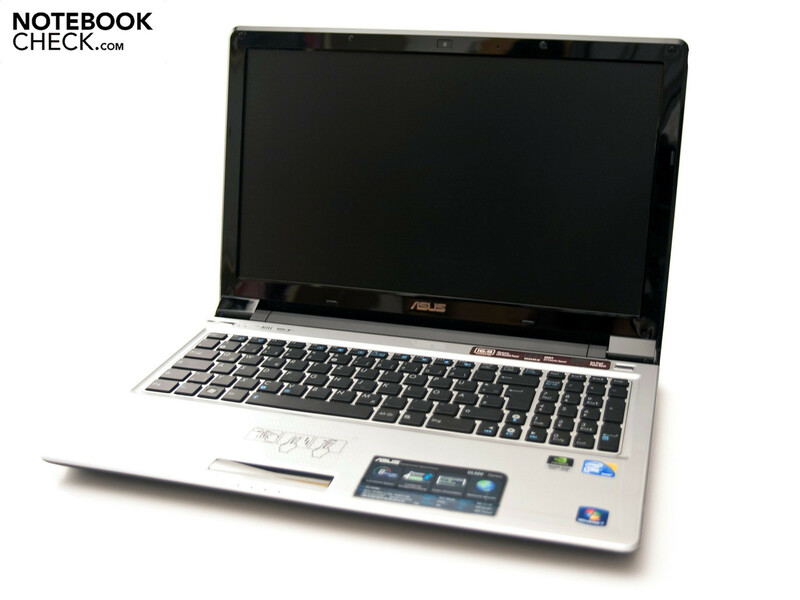 Asus offers a new notebook range that combines good performance and a high battery life perfectly with the UL range. The models are optionally equipped with an energy saving but overclockable Intel SU7300 or SU9400 processor and Intel GMA 4500 MHD. The 14.0 and 15.6 inch models additionally have a dedicated Nvidia GeForce G 210M graphic unit that can be optionally enabled or disabled. Asus also has two different display types in the alignment for the UL50 models. 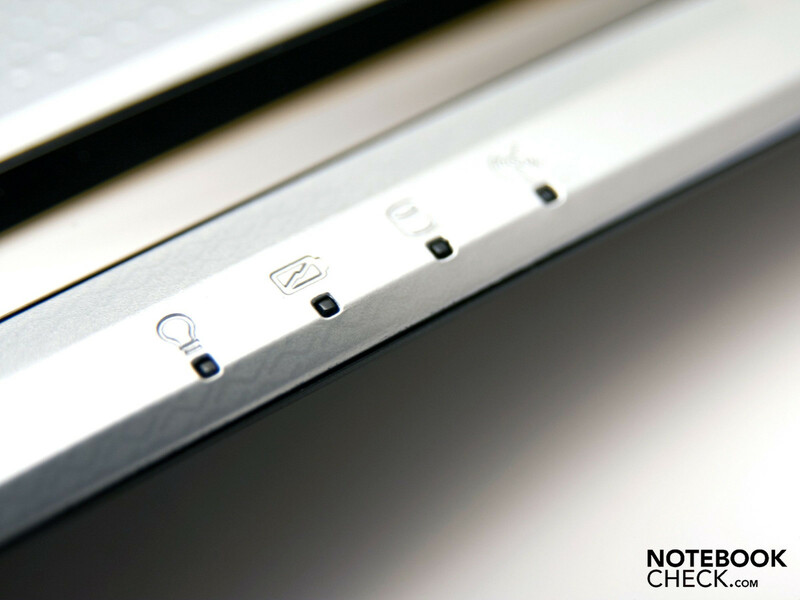 The end user can individually choose between a matt and a high-gloss display. 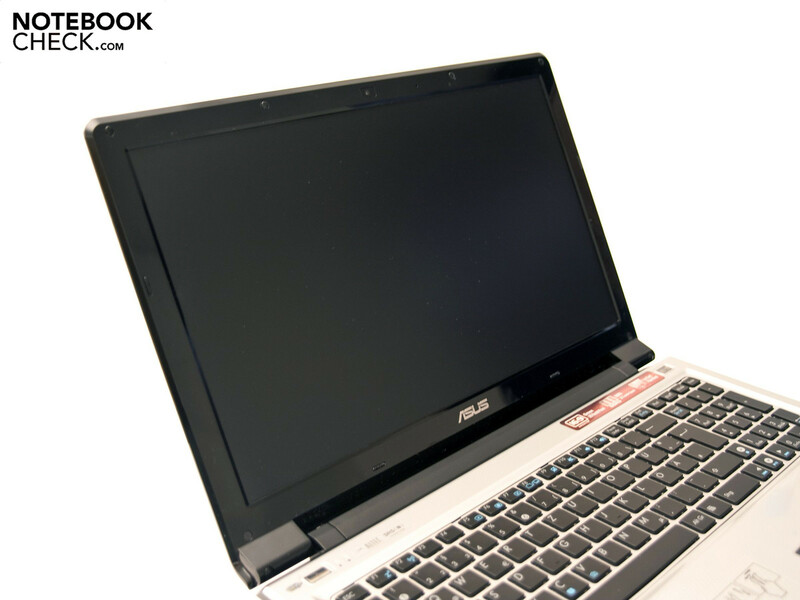 We've taken the UL50Vt-XO037V notebook for our review. Only a few data first: Our prototype is equipped with a 15.6 inch HD display (1366x768 pixels - matt), Intel Core 2 Duo SU7300 processor (1.30 GHz, ULV), a 4 GByte DDR3-8500 RAM, a 320 GByte hard disk memory from Seagate and Nvidia's GeForce G 210M + Intel's GMA 4500MHD graphic. 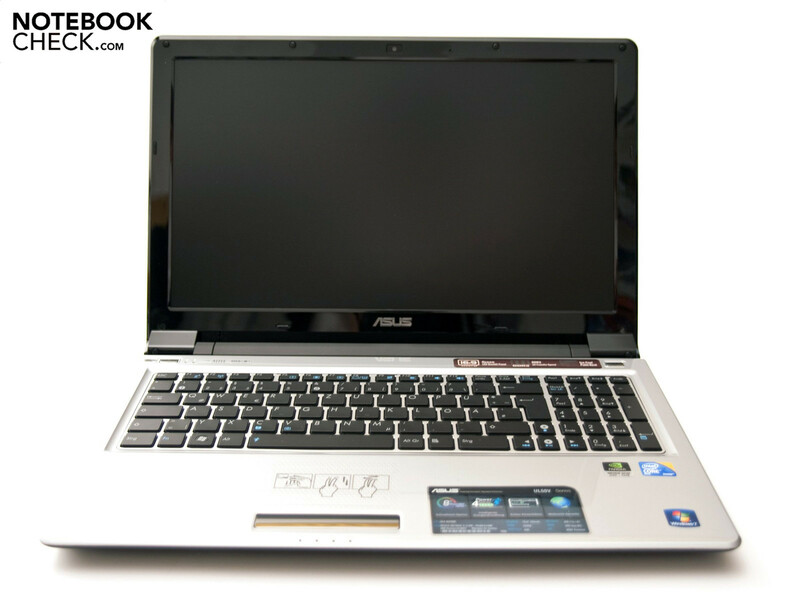 Asus offers this configuration for 899 euro (RRP, incl. VAT). In this review, read about how the UL50V does in detail. Asus makes the largest part of the case of simple plastic. A special "eye-catcher" is the display lid, as it's made of brushed aluminum. Asus only offers the UL50 in silver. The brushed aluminum is kept in the case's color. The silver alternative has been upgraded by black high-gloss elements. The smaller UL80 with a 14.0 inch display is also available in black. The design looks elegant, modern and not too obtrusive. It's overall very straight and doesn't look flamboyant. Asus has done a good job on the case's workmanship and the finish and everything makes a very high-end impression, despite the applied plastic. Manufacturing flaws are looked for in vain. The design inside reminds strongly of Apple MacBooks due to the keyboard. The UL50Vt only weighs 2.40 kilograms at a size of 368 x 259 x 16.4 - 26.5 millimeters (width x depth x height). This is a good value for a 15.6 inch notebook. The UL range especially impresses with its slim construction. The notebook's thickest place is just only 2.64 centimeters. Acer also has slim notebooks with the Timeline range. The Samsung X520 notebook is also comparable. The case is fairly stable despite the slim construction. The case only yields at excessive, point pressure. However, the keyboard area is a weak point. It already yields at light pressure. The display lid isn't very stable, despite the applied aluminum overlay. This is also due to the slim display with an LED backlight. The display hinges appear very robust because they have a big size. The display can be positioned precisely due to the good fixation. The hinges allow a maximum opening of 140 degrees. The case's bottom is kept in a matt black and only has a maintenance cover. You can access the 320 GByte hard disk from Seagate and the 4 GByte DDR3 RAM from Hynix via this faceplate. 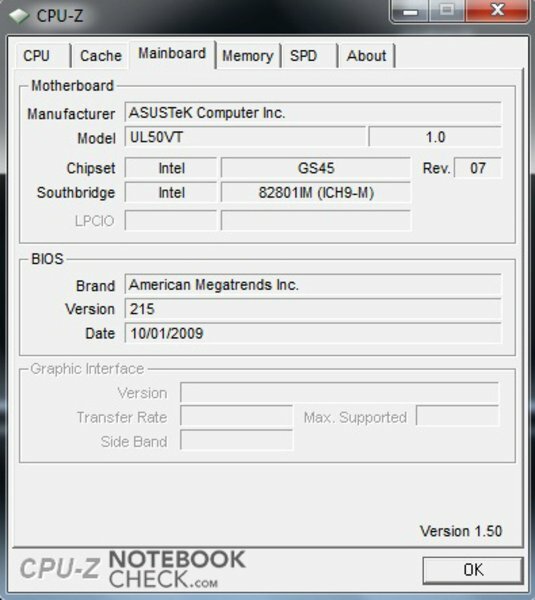 Asus states the maximum supported memory size with 4 GBytes. Every common 9.5 millimeter notebook hard disk with a SATA II interface can be used as a hard disk. 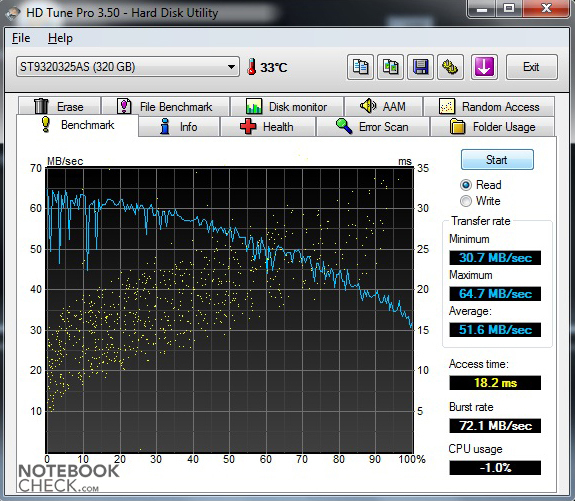 Building hard disks with a construction height of 12.5 millimeters into the notebook could cause problems. 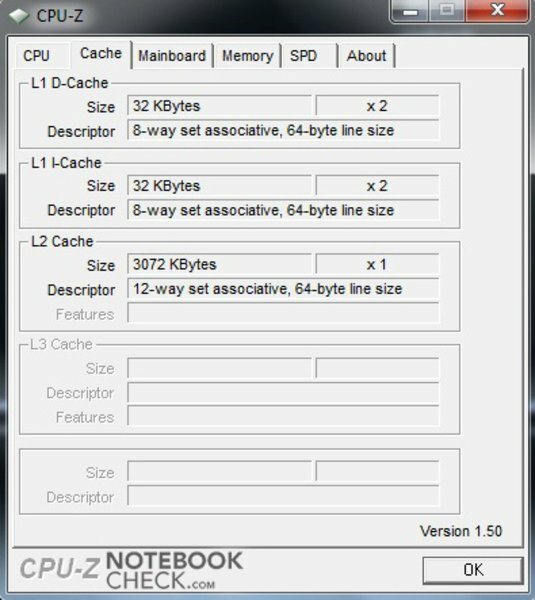 The UL50Vt-SO037V has a solid measure of connections for a multimedia notebook. 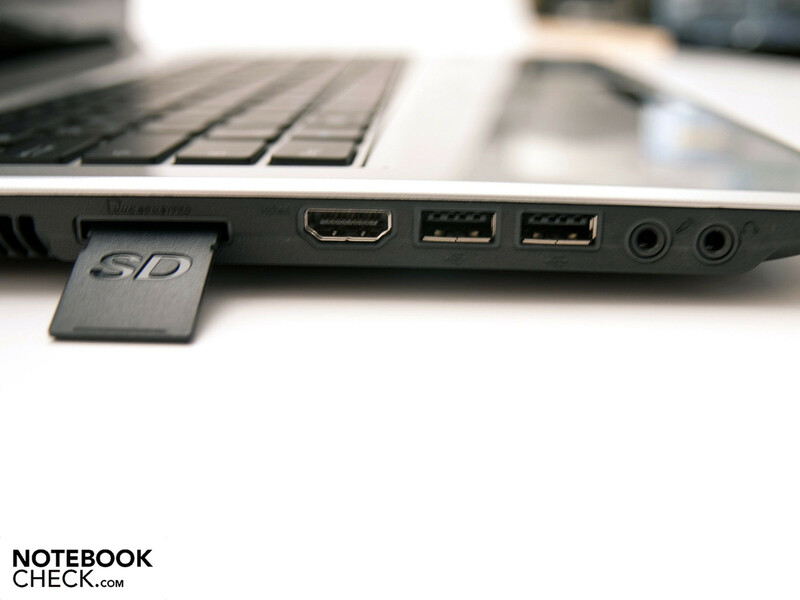 There are two USB 2.0 ports, the audio sockets (headphone-in, microphone-out), a 5-in-1 cardreader (SD, MMC, MS, MS-Pro, xD), DC-in and an HDMI port for connecting external monitors and TVs on the left. A big advantage of this is the simultaneous transmission of image and sound over one cable. Opposite, on the right, a further USB 2.0 connection, an analog video-out (VGA), RJ-45 network connection, the Kensington security slot and the Super Multi DVD drive (GU10N) from LG are found. Even older external monitors without HDMI connection can be used due to the built-in VGA interface. Asus waives further interfaces for peripherals, like eSATA or FireWire. Further connections of this field would have been desirable. An ExpressCard slot isn't integrated. Asus hasn't built-in any connections on the front due to the slim construction. You only find both integrated Altec Lansing loudspeakers. The rear is also unfettered from connections. The large lithium ion battery has a capacity of 84 Wh in eight cells. This battery occupies a large part of the case's rear. Asus has done a good job with the port distribution. Only both USB ports on the left have been built-in a bit too close to each other. Thus, space problems can turn up with big USB plugs / sticks / modems. A larger clearance between the USB ports would have been desirable. Generally, a wide range of connections are given and the distribution has been well executed. 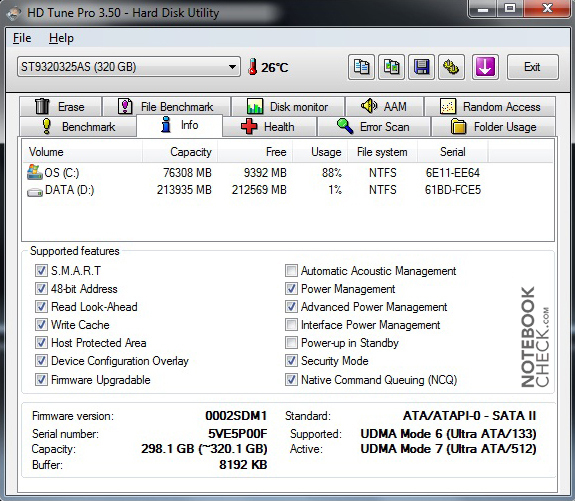 As in almost all new releases in the notebook division, the UL50Vt has also been equipped with Windows 7 (Home Premium). The 4 GByte RAM are completely supported by the used 64 bit operating system and the work velocity is a bit quicker because of this. Asus additionally bids a 60 day trial version of Microsoft Office 2007 (Excel 2007, OneNote 2007, PowerPoint 2007 and Word 2007), a trial version of Trendmicro Internet Security, Cyberlink Power2Go, ExpressGate, Game Park, a games collection, Adobe Reader 9 and, of course, programs of its own. Among a few feasible programs, such as the AI Recovery Burner or the LifeFrame software for the integrated webcam. Unfortunately, the supplies can only be seen as "standard scope of delivery" because Asus has only included the most necessary. Thus aside from the notebook, you get the adapter with cable, the 8 cell battery, a user's manual, drivers, software & recovery DVD, manuals, a warranty card and a Velcro fastener for the included adapter. 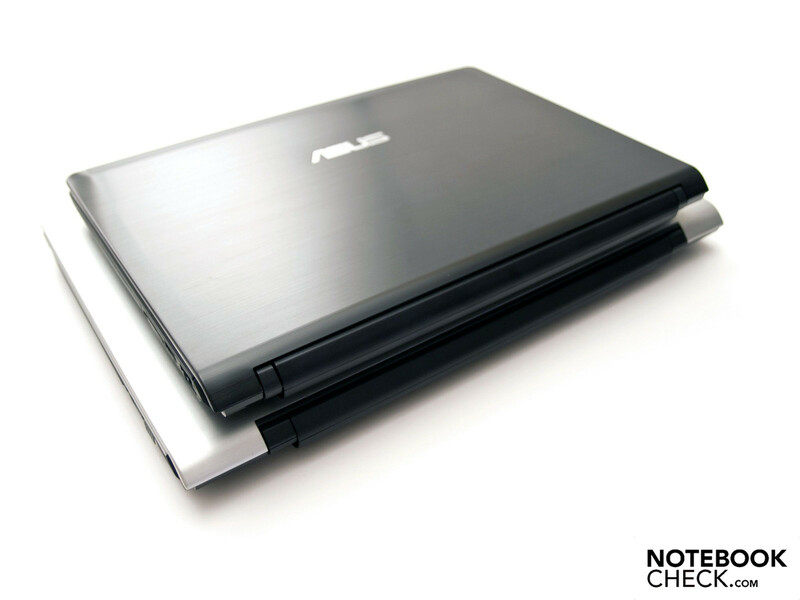 However, Asus offers a whole range of optional supplies for their notebooks. Amongst others, cases, mice, memory extensions, warranty extensions and a replacement battery, which is available for 199 euro. The correlating Asus adapter costs 99 euro plus pending shipping. 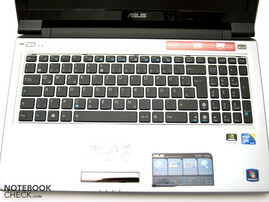 Asus has integrated a separate numerical block due to the sufficiently sized 15" case. The keyboard has a medium-short stroke length and a user-friendly layout. The keys have been placed several millimeters apart in a grid of 19 x 19 millimeters, whereas the key's stroke surface has a size of 16 x 16 millimeters. The noise development at typing and the instable underground is annoying. The keys emit an annoying, high-pitch sound even when typing slowly. The keyboard's underground yields even under light pressure. The Fn function is imprinted in a nice and striking light blue. 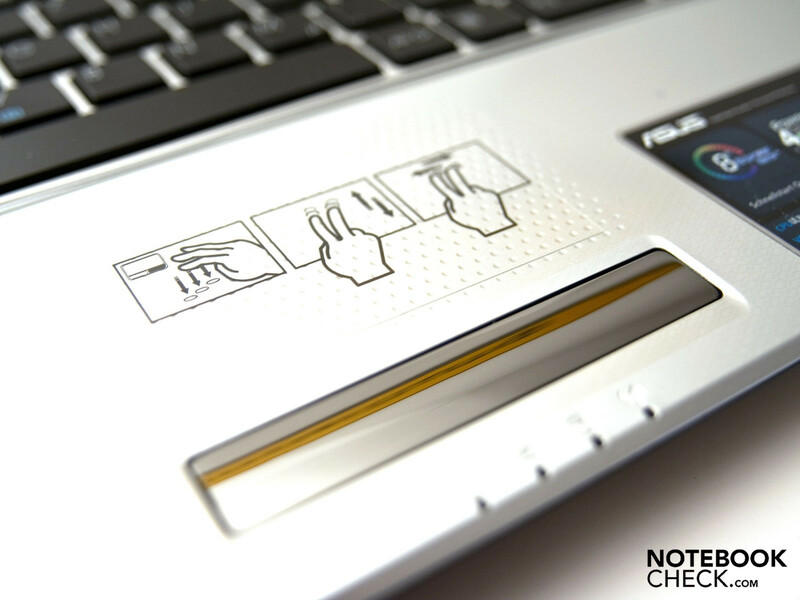 The notebook's power button is found on the right and a hardware switch for the integrated graphic unit is on the left above the keyboard. You can call on three different performance modes (High Performance, Power Detection, Power Saving) with these buttons, which switch the according graphic chip set during use, depending on the setting. The UL50Vt's keyboard layout won't be a problem for touch typists. You accommodate yourself quickly to the large layout that reminds of the MacBook keyboard in terms of design. 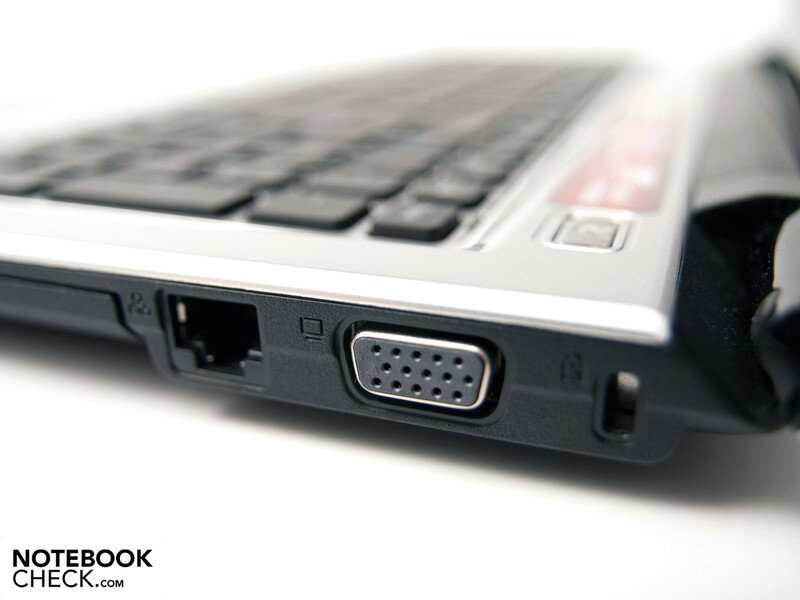 The integrated touchpad has a pleasant surface that has small craters. You can navigate precisely and easily with it. 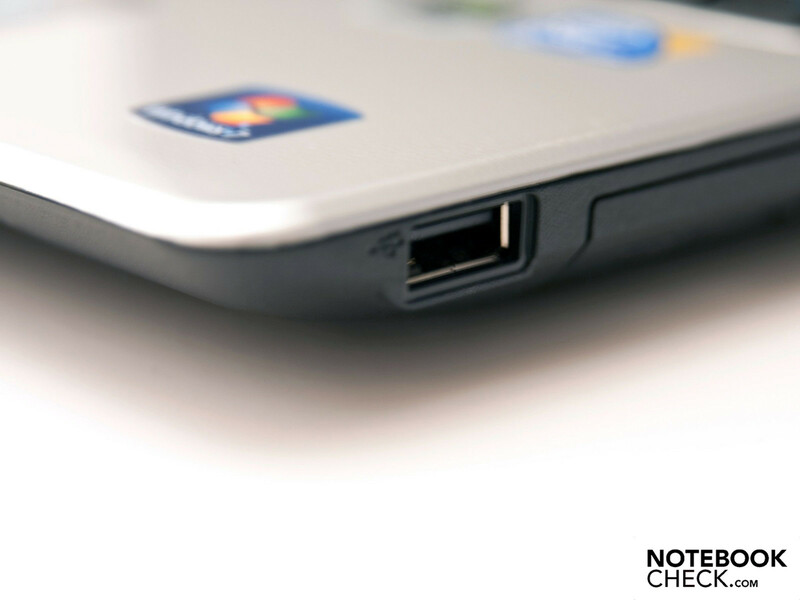 The touchpad has a size of 79 x 48 millimeters and is directly implemented into the case. Thus, there is no bezel that separates the touchpad from the case. The response sensitivity is good and the setting options are very comprehensive. The touchpad supports various multi-touch gestures. Among others, zooming and scrolling on the horizontal and vertical plane. 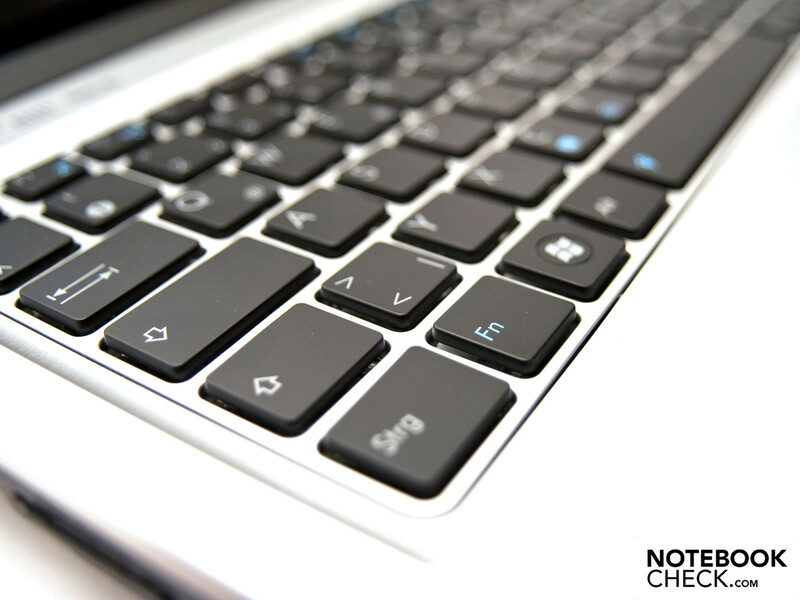 The mouse keys are found directly underneath the touchpad and a big bar with a chrome look. The keys have a pleasant pressure point and response time. 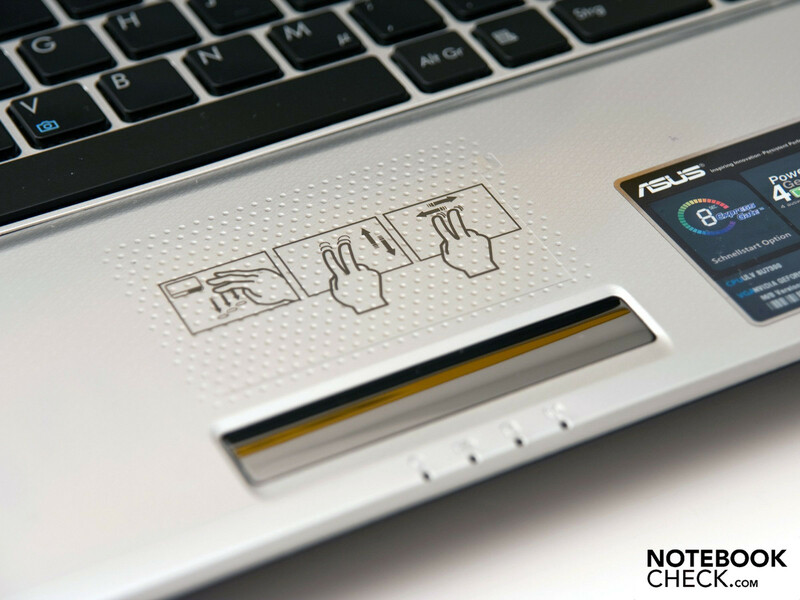 Asus hasn't built-in a fingerprint scanner, which isn't necessarily a disadvantage. The UL50VT is equipped with a 15.6 inch LED backlit display that has a maximum resolution of 1366 x 768 pixels. A high-gloss display is used in most notebooks with a 15 inch screen. Luckily, this is different here: Asus offers a matt display alternative for the UL50Vt-XO037V. The slightest reflections develop in a deactivated state, but they disappear as soon as the notebook is turned on. The display complies with HD Ready requirements with a native resolution of 1366 x 768 pixels. This especially important for multimedia notebooks because only narrower black bars on the edges (movie rendering) due to the high resolution and wide screen format. The screen's illumination of 80% has to be denoted with "good". The average maximum brightness is a sufficient 147 cd/m2. These values should just be enough to work outdoors and in adverse light conditions. We noted positively that the maximum display brightness can also be called upon in battery mode. Subjectively, color representation and saturation are alright. The rather low contrast ratio of 145:1 leaves a poor impression because black looks more like gray because of a high black value of 1.11. The viewing angle stability on the horizontal plane is stable and the colors as well as the content can be well recognized even from obtuse angles. The color tone only changes slightly. It looks different on the vertical plane. The image is already no longer optimal and the content isn't flawlessly readable anymore at slight deviations from the ideal viewing angle. 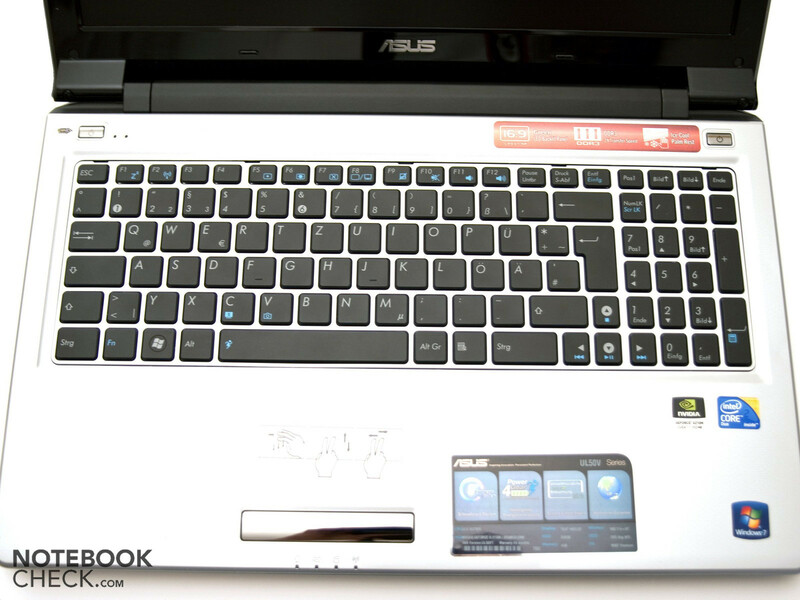 Our prototype, the Asus UL50Vt-XO037V, has rather been attuned on the multimedia field. An Intel Core 2 Duo SU7300 processor (ULV) with a clock rate of 1.30 GHz is used as a processor. It has a very low power consumption and a good performance at the same time, due to the two core architecture. 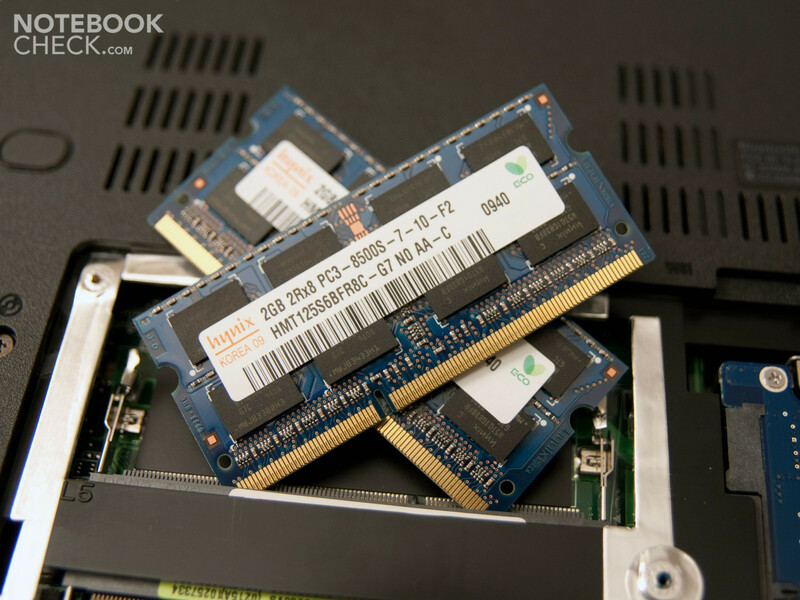 Additionally, a 4 GByte DDR3-8500 RAM from Hynix and a 320 GByte SATA hard disk from Seagate (Momentus 5400.6, ST9320325AS) have been built in. 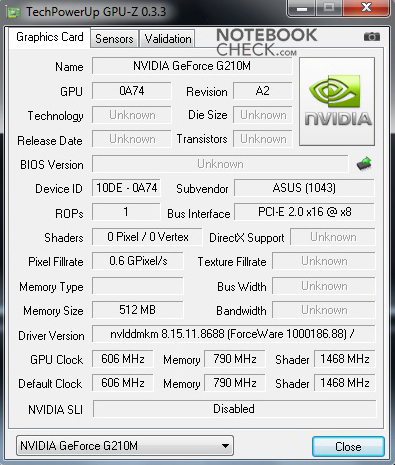 In terms of graphics, Asus uses a hybrid solution. First, an Intel GMA 4500MHD chip set graphic is built-in that has enough performance in the office. Then, a strong Nvidia GeForce G 210M graphic chip set with a core rate of 625 MHz is integrated that makes it possible to render HD video material, for example. The hardware configuration makes a high battery life paired with a good graphic performance for multimedia applications possible. In order to assess the possible performance, we sent the Asus UL50Vt through our benchmark course that includes various benchmarks and a few games. 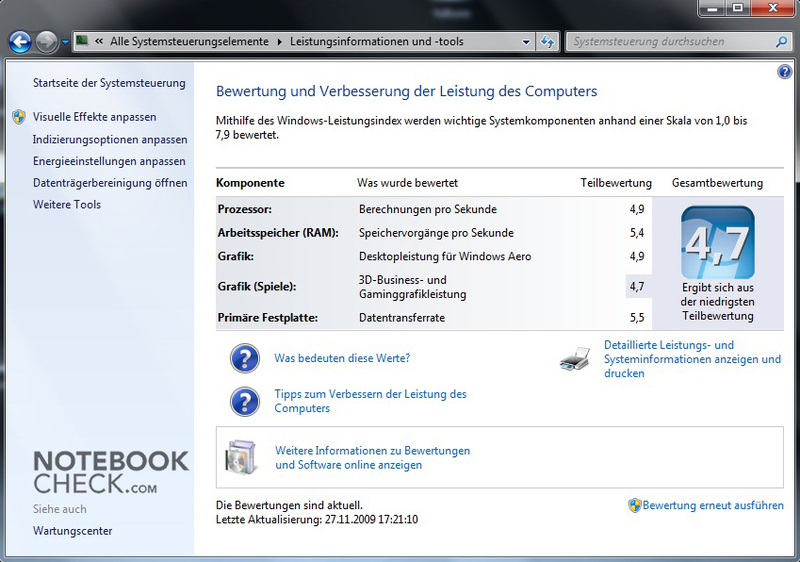 All tests were executed in the high performance profile and all energy savings options under Windows 7 were disabled. A very important feature of the UL range is Asus' Turbo33 technology, which overclocks the processor and, according to Asus, supplies up to 33 percent more performance. The CPU's clock rate of our prototype rocketed from 1.30 to a remarkable 2.13 GHz (+64%!). Thus, the processor in high performance profile is about on the same level as an Intel Core 2 Duo P7350 that supplies a clock rate of 2.00 GHz. We executed our benchmarks with the increased clock rate. First we ran the notebook through Futuremark's 3DMark range. In older benchmarks, like 3DMark 2001 SE!, 2003 or 2005, results of 17585, 10923 and 6826 points were reached. 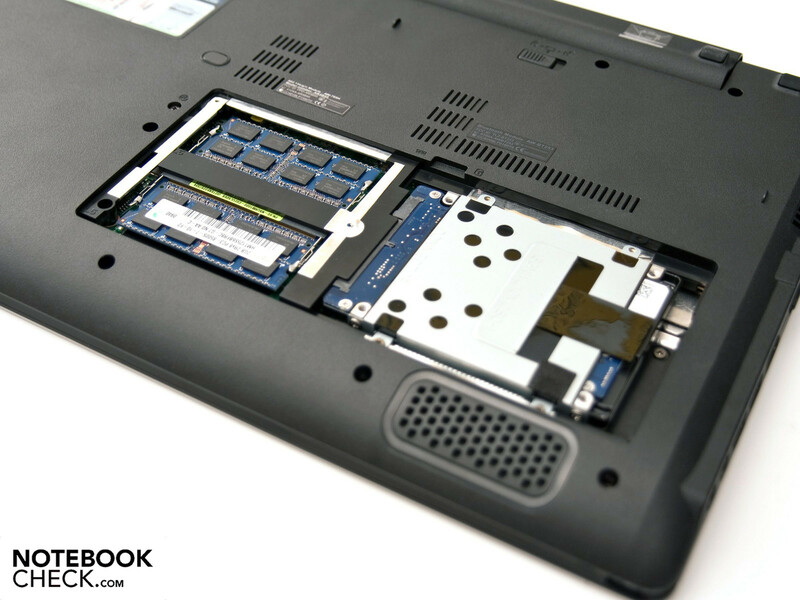 The MSI Megabook GX600 or the Asus M51SN with a GeForce 9500 GS graphic chip set provides similar performance. 3418 and 1008 points were reached in newer benchmarks such as 3DMark 2006 or Vantage. 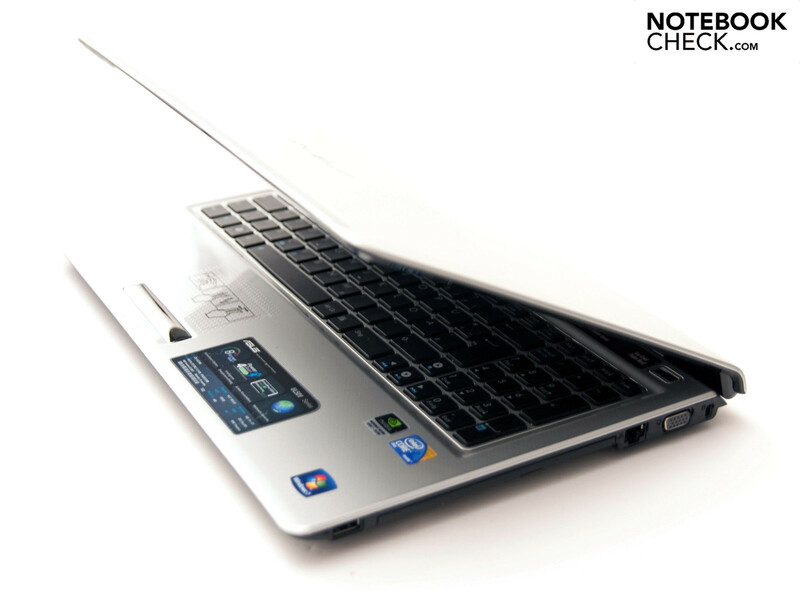 The reviewed Dell Studio 1557 or the Sony Vaio VGN-NW11S/S notebook is comparable here. PCMark 2005 couldn't be executed properly even after various tries and software updates, and we couldn't establish any rate. The newer version, PCMark Vantage, could be started without any problems and a total of 3437 points were achieved. 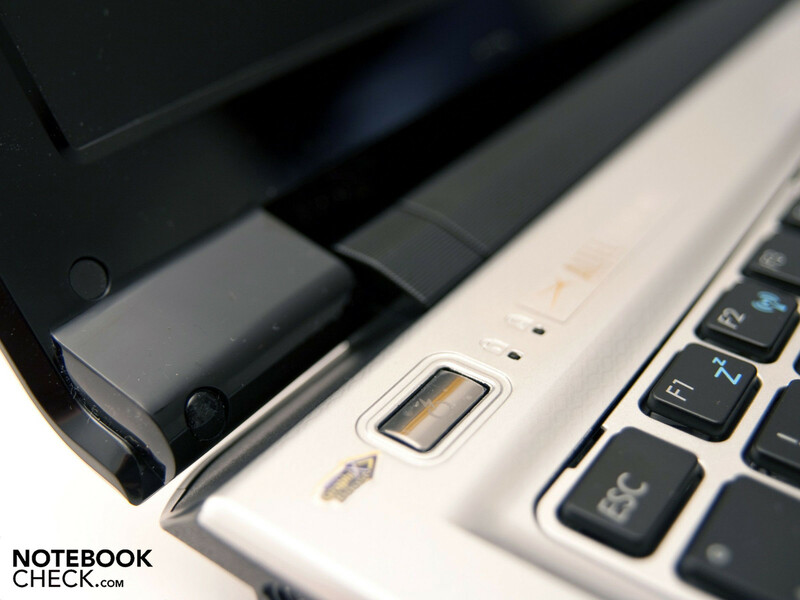 The Acer Aspire 5739G notebook and the Apple MacBook Air are comparable notebooks for this field. 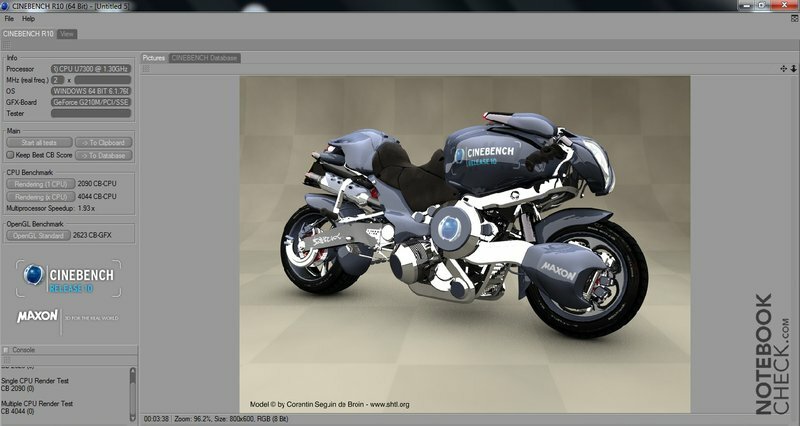 The UL50Vt managed 2090 points in single-core rendering of the CPU-biased Cinebench R10. It is 4044 points in multi-core rendering and still a good 2623 points in Open GL Shading. 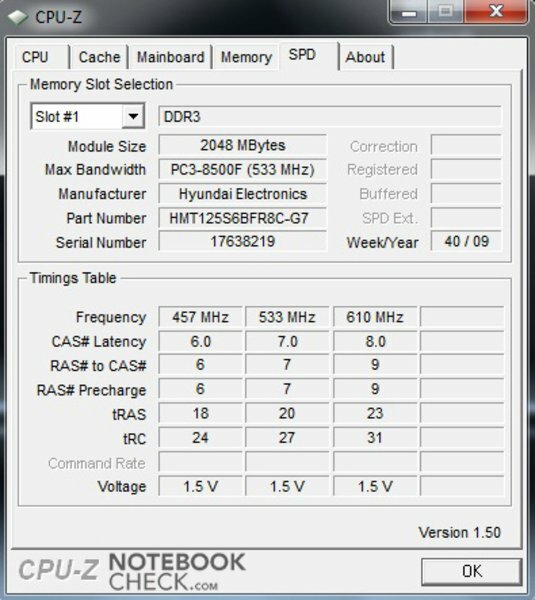 Intel's T7250 CPU (2.0 GHz) in Sony's BZ26M, for instance, reached 2093 points in single-core rendering, and the T6400 CPU (2.0 GHz) in Acer's 6935G achieved 2107 points. The UL50 positioned itself similarly well in the multi-core test. 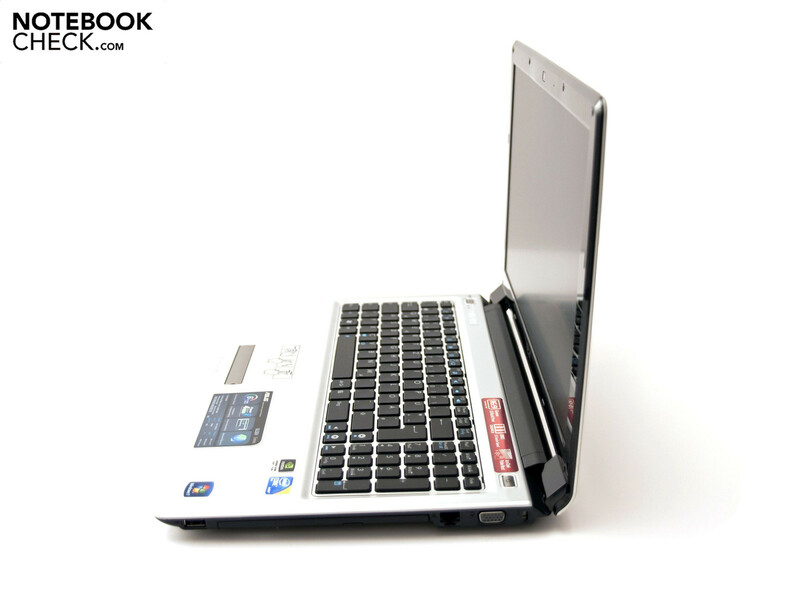 The Acer 5739G reaches a comparable 4063 points with the employed P7350 CPU (2.0 GHz). We ran the Super PI computation on the 1, 2 and 32M levels. The rates were between 29 and 1593 seconds. 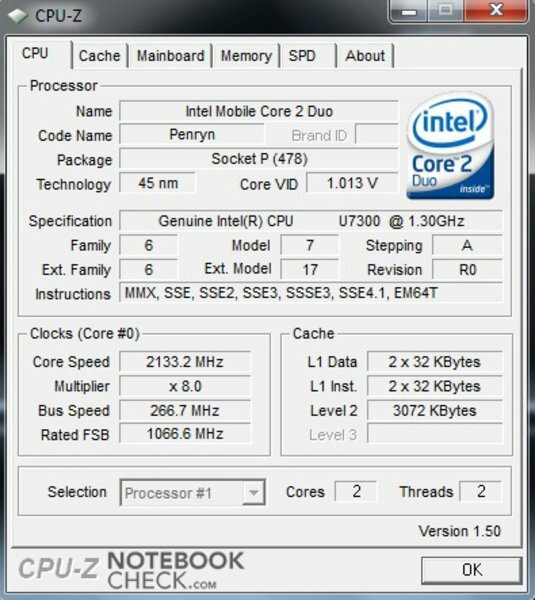 The SuperPI also confirms that the overclocked SU7300 CPU ranges on about the level of an efficient Core 2 Duo chip, in this case for instance, the T7300 CPU with 2.0 GHz. You can see how the results are positioned in comparison to other processors and graphic cards in our comparison of mobile processors and the graphic card comparison. 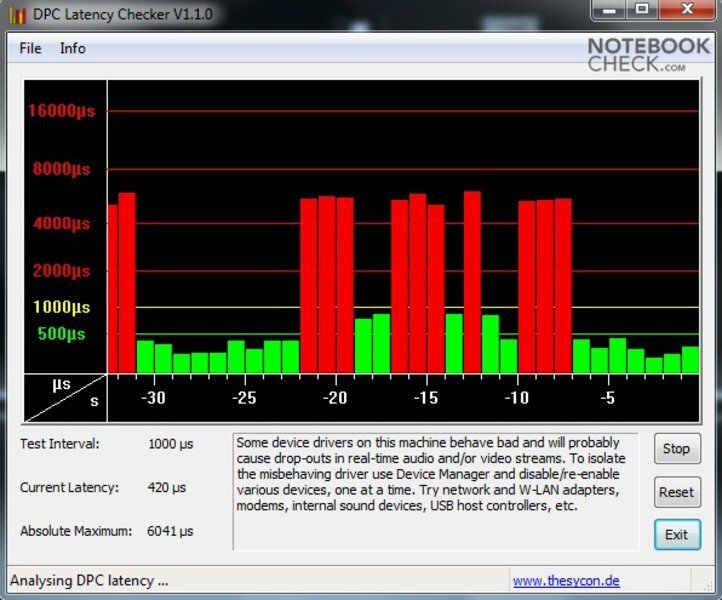 We used the program "DPC Latency Checker" in order to test the latencies under Windows 7. A few measurements were beyond the 1000 µs mark, whereby it could come to communication problems with external devices (audio transmission). Because the UL59Vt-XO037V is equipped with Nvidia's GeForce G 210M graphic chip set, we also took a look at the game performance with two current game tracks (Anno 1404 and Racedriver GRID). We didn't execute any further games, as the notebook hasn't been exclusively made as a gaming notebook. At the moment, Ubisoft offers the probably most beautiful strategy building game that enthralls gamers of all ages with Anno 1404. The anticipation quickly dies in a resolution of 1024 x 768 pixels, maximum details and 4 x AF (anisotropic filters) because only 18 fps are reached. We could assess 22 fps in the native resolution of 1366 x 768 pixels at a medium detail level with 2 x AF. You notice that it does jolt quite often when you look closer. Anno 1404 runs fairly smooth with 24 fps in the same settings without AF and it can be played without bigger interruptions. We took a complex race simulation with Racedriver GRID, which also occupies a few system resources. A maximum of 18 fps are reached at 1280 x 768 pixels, maximum details and 4 x AF and you can more or less forget gaming. As in Anno, only 22 fps could be reached on medium details, 2 x AF and a resolution of 1366 x 768 pixels. The game didn't jolt as much, but it wasn't smooth either. If AF is disabled, it's a whole 24 fps. But it's not really fun here either. It should be apparent that the UL50Vt isn't a gaming machine. If you can do without high details and AF, you can get current games to run on the device with a few compromises. 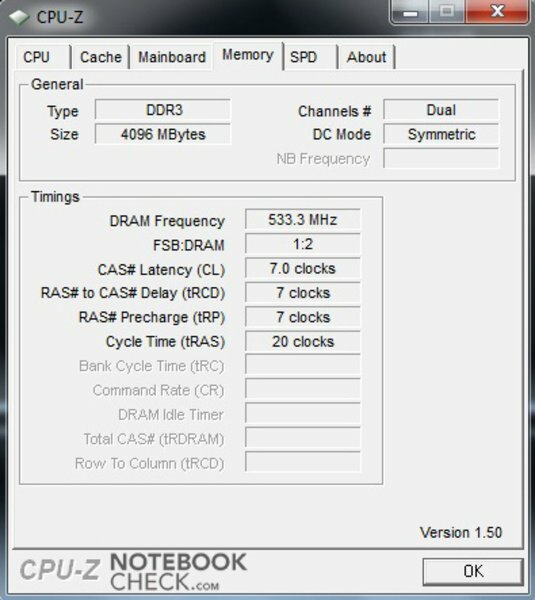 The notebook is barely audible with 32.6 dB(A) in battery mode and it gets marginally audible only under load or hard disk access with 32.6 - 33-1 dB(A). Our prototype is within a normal, pleasant range in terms of noise development. However, the fan emits a quiet noise constantly in normal mode, but which doesn't disturbingly come to the fore. As soon as you want to enjoy a DVD movie, the volume level increases considerably, though. A maximum of 36.4 dB(A) has been observed at DVD rendering. The noise level fluctuates between 37.2 - 44.4 dB(A) under load. The fan develops 37.2 dB(A) at normal use. You hear the notebook at this level but it stays within an acceptable field. The noise development quickly increases in a disagreeable field under full load. We measured a maximum of 44.4 dB(A) in this state. Except for a few value under full load and at DVD rendering, the established values, measured at a distance of 15 centimeters, were within an acceptable field. We measured the temperatures at a room temperature of 23.0°C. The recorded values of a maximum of 40.7°C in the keyboard area and 47.1°C selectively on the case's bottom, each measured under load, are within a reasonable field. Restrictions won't turn up with the established temperatures, but it could happen that working longer under load on the lap gets unpleasant. The included adapter develops 54.1°C at a room temperature of 23.0°C. Thus, the adapter is within a normal field. The observed temperatures barely exceed the 30°C mark in less demanding office mode. (±) The maximum temperature on the upper side is 40.7 °C / 105 F, compared to the average of 36.5 °C / 98 F, ranging from 21.1 to 71 °C for the class Multimedia. Because the UL50Vt has mainly been conceived for the multimedia field, the loudspeakers should have a certain sound quality. Asus has built-in two stereo loudspeakers from Altec Lansing on the bottom for sound rendering, which provide a good sound. This stands out evidently from the poor standard loudspeakers that are used as a rule, but they aren't perfect, anyway. The deep pitches and basses are barely existent, the high pitches partly come to fore too directly. Overall, the sound is okay, though. For a better sound quality, it's recommendable to use external devices even here. The true strength of the UL50Vt is found in the point battery life. It supplies a good performance due to the built-in Nvidia GeForce G 210M paired with an energy sparing Intel Core 2 Duo SU7300 processor that has a maximum power consumption (TDP) of only 10 watts. We've checked the battery runtimes with the program, "BatteryEater" and executed four different measurements. The UL50Vt reaches a battery runtime of 3 hours and 17 minutes under full load in BatteryEater's Classic test with a maximum display brightness, enabled WLAN and dedicated graphic in the highest performance profile. We could record a good time of 5 hours and 34 minutes at DVD rendering with maximum display brightness. The third test exclusively occupies itself with internet use via WLAN including a good display brightness and an energy savings performance profile. The maximum battery life was reached after exactly 8 hours and 59 minutes. The runtime in BatteryEater's Reader's test with minimum display brightness, disabled WLAN, integrated graphic chip set and maximum energy savings options is probably the biggest plus point. The notebook stopped work after a very long 12 hours and 27 minutes. That is a very good value for a 15.6 inch notebook. 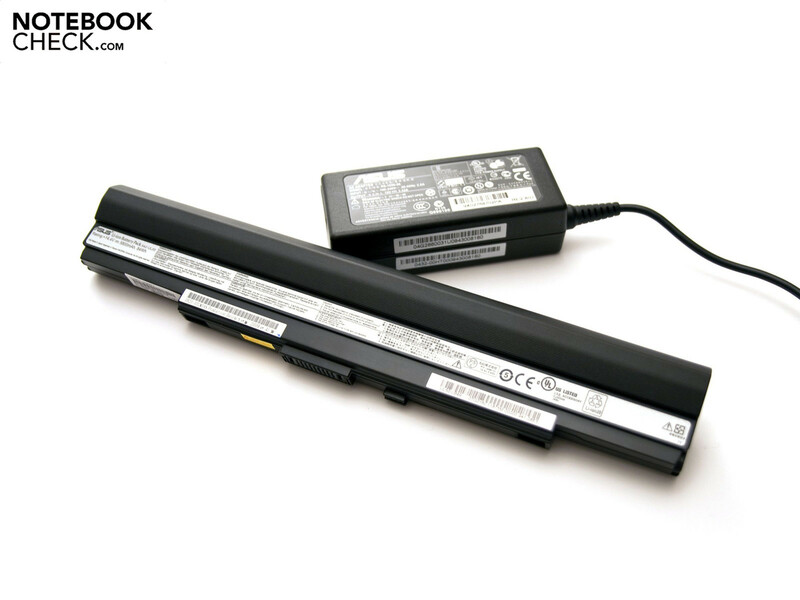 Comparable notebooks with a similar battery life are offered by Acer with the new Timeline range. The power consumption of our prototype is largely within limits. Between 8.7 and 12.3 watts are consumed in normal mode. We noticed the power consumption of the Asus screen saver with maximum display brightness negatively. The notebook needs a high 23.5 watts in this field. 38.1 to 53.9 watts are consumed under load. These rates are in a normal range for a 15.6 inch notebook with a dedicated graphic. A further point that we didn't fancy is the power consumption of 0.1 watts in a deactivated state and 0.2 watts in standby. Many notebooks that come on the market today don't consume any electricity at all in a deactivated state. 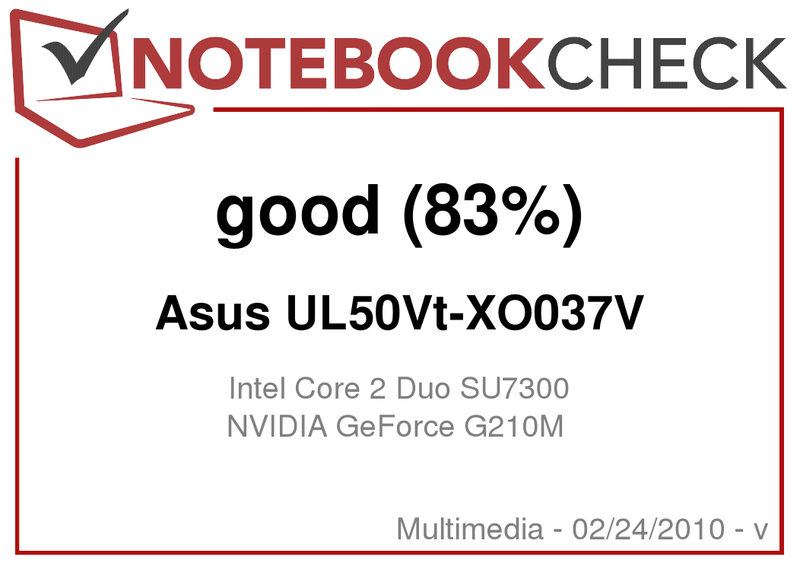 After almost two weeks, the Asus UL50Vt-XO037V now departs from us again and leaves mainly a positive impression. The case is very elegant, even if it has a small weaknesses, such as in the keyboard area. 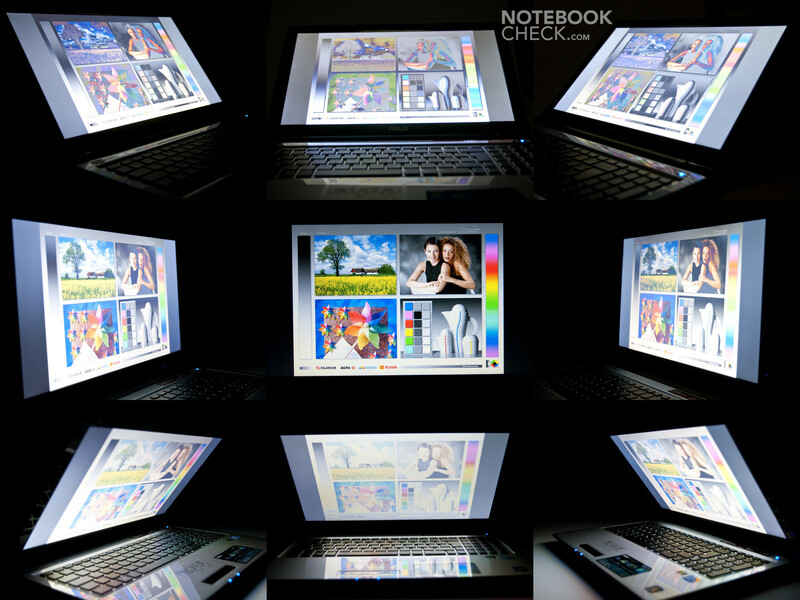 The connectivity options are, as to be expected in a multimedia notebook, completely sufficient. The 15.6 inch display complies with HD Ready requirements and provides a good image, even though it lacks contrast and the black appears more grayish. The matt display for a reflection-free image is positive, though. The performance is comparably good due to Nvidia's GeForce G 210M graphic chip and the overclockable ULV-CPU. At the same time a very long battery life of over 12 hours can be reached because of the hybrid solution with two graphic chips and Turbo33 technology chosen by Asus. Thus, the UL50Vt secures itself a top ranking in the battery life field. Basically, the good workmanship, the chic and elegant design, the very high battery life, the optional dedicated graphic unit and the acceptable price for the device. A stable keyboard unit, maybe a few more supplies and at least a different color alternative for the UL50Vt. The very long battery life with the good performance in the multimedia field, that is to say the well functioning hybrid solution with Nvidia's GeForce G 210M and Intel's GMA 4500MHD. Acer's new Timeline range (TravelMate 857, Aspire 5810T) that also promises a long battery life, as well as a good performance and Samsung's X520 notebook that can play in the same league.